Want to up your Branding Game On Social Media? There’s no doubt that a strong social media presence is vital for your business in this day and age! But… What exactly does it take to crush it on the various behemoth social platforms? Don’t you wish someone could just give you all the answers? Well… Today is your lucky day! We’ll uncover some of the best kept social media branding secrets. Most importantly, we’ll do so in simple and actionable steps so even a complete beginner can find their way to social media greatness. If you wan to dig right into a specific channel and skip some more general tips, just click on a specific section in the Table of Contents below. Let’s talk about branding 101. When people come into contact with your business, the first thing they tend to notice is your logo and visual identity. A strong brand communicates who you are, what you stand for, and can even be the reason why people engage with your business in the first place. With all this in mind, it’s important to project a consistent image across all of your social media platforms so that you can stand out from the crowd and keep people coming back for more. A strong brand increases trust, employee satisfaction, and even a company’s overall value due to a huge increase in brand equity like in the case of Nike or Apple. For more on the importance of branding, check out this article. We’re assuming you’re reading this because you already have a logo that you love and that is consistent with your brand’s values. If not, don’t worry. Here are a few quick tips to gain a professional visual identity. If you already have a logo and want to skip this section to get straight to the juicy stuff, click here. A professional logo can benefit your business in more ways than one! All of this boils down to one thing… Building a strong and sustainable relationship with your audience and customers. Let’s dig into social media branding now! What’s magical about social media is that you can broadcast your business and values to the world – totally free! That doesn’t mean you should just start blasting random pieces of content on all platforms without any sort of game plan! Different types of content perform better on different platforms, and mastering each platform individually will yield huge dividends in building a loyal following. Begin with identifying the platforms where your target audience is most active. Facebook, Twitter, LinkedIn, Instagram, and Pinterest are just a few among many to choose from. Your job is to pick out the golden nuggets that will work best for your business. You do not have to be equally active on all platforms. Instead, try to focus on building a great presence on the most important platform(s) for you. This step may take a bit of testing and research. Let us know in the comments section if you’d like us to write a post about what social media outlets are best for certain types of business. Click each section to find out how each platform might be relevant for your business, or scroll down to learn more about all channels. Facebook is absolutely massive and is a key platform for just about any business, regardless of industry. Two billion people use Facebook every month. That number alone says a lot about the opportunities this platform has to offer to your business. People come to the platform for all kinds of reasons whether it’s to keep in touch with friends and family, keep up to date with personal interests, or even find information about a business! But you probably know this already. In general, Facebook is a pretty casual environment which usually requires a marketing strategy with an easy and relaxed approach. To succeed on this platform, we recommend being open, friendly and offer as much value as possible to potential consumers. The first thing you need to do is create a Facebook Business Fan Page so that your business has a central hub for people to interact with. Here your audience will be able to like and follow your brand so that they will see your posts and updates. If your content is engaging, people will share your posts with their friends, which is a great opportunity to get your business noticed! 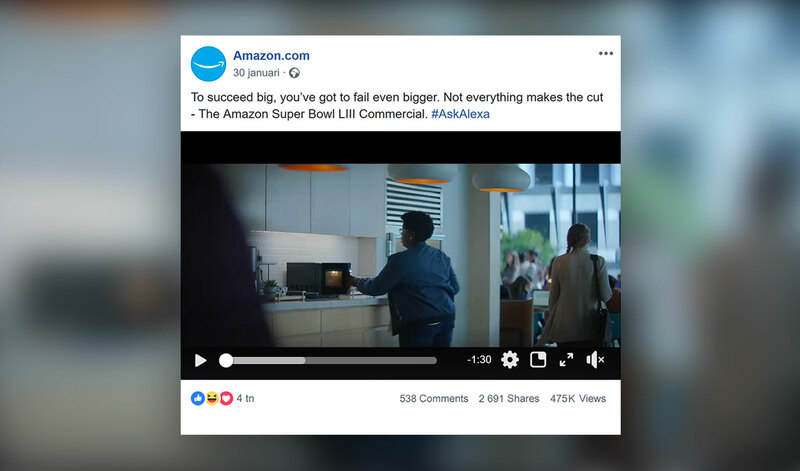 If you’d like to spend some money to pick up traction faster, Facebook is a great platform to promote your content and make your brand more visible. Through Facebook ads and promotional post you can specify your target audience and have your business reach more people through an ad campaign! When writing content for Facebook, be sure to use language that is casual and targets your potential audience. A great way to optimize your posts is by using the same tone that your customers are using in the comments section to describe your products. We love this article about how to write amazing Facebook posts for your business. A consistent tone of voice in combination with a beautiful graphic profile will help your business to stand out from the crowd on Facebook. Another huge social platform owned by Facebook is Instagram. With over 400 million daily active users, your reach is almost limitless. The key to Instagram marketing lies in user behavior and engagement from users means your posts will get more likes and attention. When you post an image to Instagram, the app will first show it to a small number of followers. If nobody engages (likes, comments, or shares) with the post, Instagram’s algorithm will shut it down and very few people will actually see the post. With that being said, engaging, visually appealing content is extremely important on this platform! Check out this awesome article on Instagram’s new algorithm and how it decides what it’s users see. In comparison to Facebook, businesses that have a presence on Instagram have much greater overall engagement from their followers. According to Brand Watch (read their article “47 Incredible Instagram Statistics” here) the engagement with brands on Instagram is 10 times higher than Facebook. Because Instagram mainly deals with images and videos, users are more sensitive to a beautiful aesthetic. Having a professional logo can add to this aesthetic. It’s also recommended to set a strategy regarding the visuals of your posts and the style of your feed. And while we’re on the topic of feed. Having a stunning feed is a great way to convert new visitors into followers on Instagram. In addition, a well thought out feed helps your brand look professional and serious. Stay consistent in your imagery and communication so that followers and potential customers come to know what to expect from your business! Here’s an article detailing many of the great themes that excel on Instagram to make your feed look amazing. There are hundreds of great third-party apps out there (our favorite is called Preview) where you can upload posts beforehand within the third party app in order to preview what your feed will look like after posting your images to Instagram. This can help you assemble your posts in a well-crafted way and ensure that your official feed on Instagram always stays amazing! Want to take this one step further? Check out the two feeds below. Both are extremely large car companies. One has 13M followers and the other only has 167k. Which feed looks more visually appealing? Who would you rather follow? 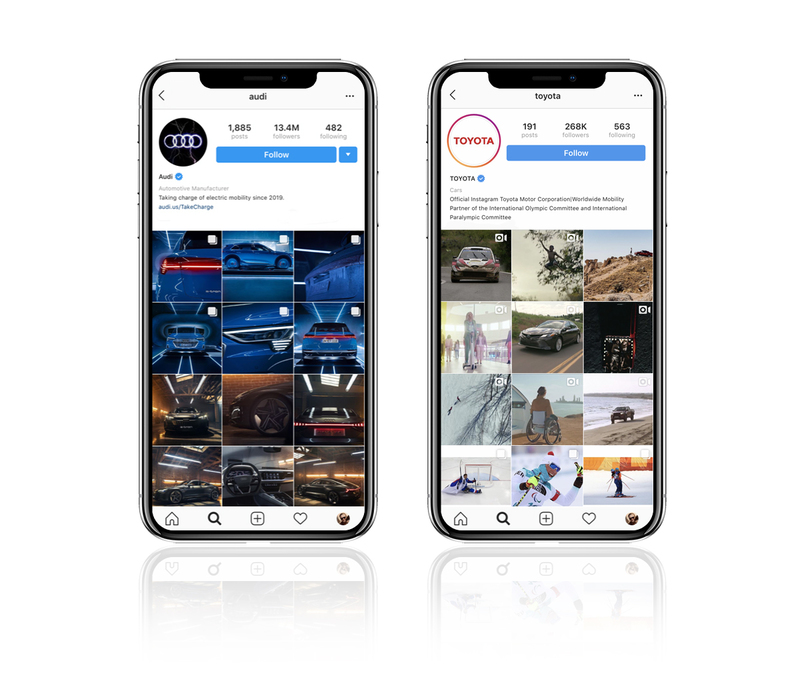 Even though Toyota more than 4 times the revenue of Audi, they have a lousy one-tenth the number of followers on Instagram. Perhaps this could be due in part to a cluttered, inconsistent, and uninspiring feed. Where Instagram is the king of visuals, twitter is the go-to place for fast news and quick bits of information. It can be a great way to connect with customers and clue people in on the latest developments going on with your business. One of the best ways to build connections on Twitter is to follow tweeters in your related field and become an active part of the community. People, authorities, and companies are all active on Twitter. Mixing official tweets with fun news is a great combination for maximum engagement. If your followers retweet something you’ve posted, it gets shared with their followers as well. Because of this, you can create a sort of viral effect on Twitter if your tweets are especially interesting. A dialog is the most common form of content on Twitter and often times people may tweet at you directly with questions or comments. As with any platform, it’s important to engage with the people who engage with you so be sure to answer peoples tweets and questions when they’ve taken the time to write to you. By interacting as much as you can you will increase your following and your relationship with your audience! Because tweeters mostly use dialog, tweets with pictures have the potential to stand out and gain more attention. If your tweets have pictures that contain your logo it can help give your brand additional exposure. 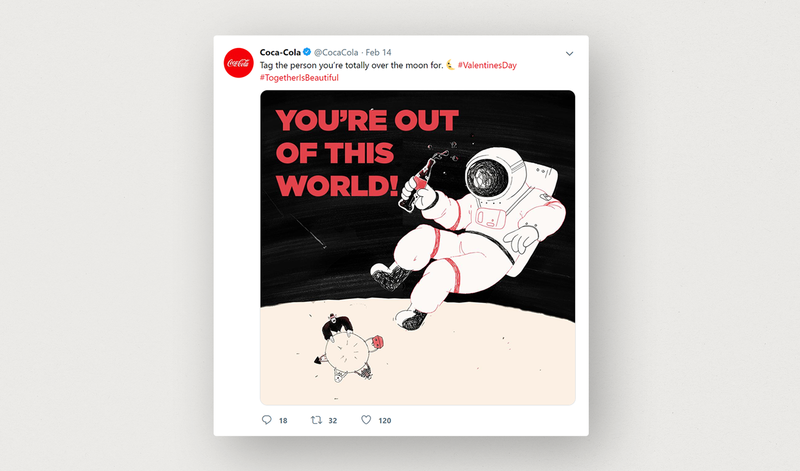 Here’s an example of a tweet from Coca Cola which uses a visual rather than just text. When popular topics in your field of business are trending write interesting tweets and if applicable use pictures with your logo that speaks for your brand. Here’s a link to learn more about writing tweets that get engagement on Twitter. For business related discussions people tend to come to LinkedIn. The marketing strategy here is a bit different from other more casual platforms. Because there are a lot of professionals on LinkedIn, it may be better for your content to be a bit more polished than what you would typically post on Facebook or twitter. In groups on LinkedIn you can share content with people who have an interest in your business and your business’s status. LinkedIn is also great for creating a tribe feeling among employees and for posting job openings. 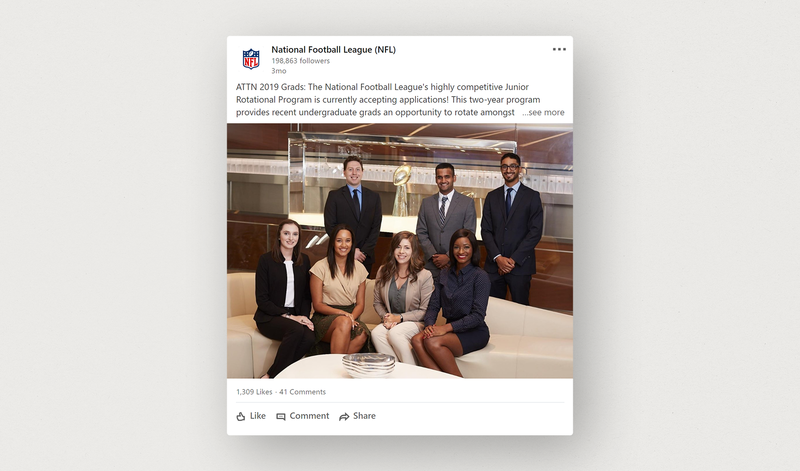 Here’s an example of the NFL posting about a potential job opening. Answering questions and giving your opinions in discussions will create trust and let people know that you have a good presence in your industry. LinkedIn has a great feature with recommendations where you can ask customers, clients, or partners to recommend you. Keep in mind that your logo and graphic appearance can influence the way people see your company so you’ll want your visual profile to be on point. This helps ensure that your brand comes across as strong and professional. Here you can read about more ways to build your brand on LinkedIn. On Pinterest you can use boards to show what your business gets inspired by and also attract people to follow your boards. You can pin your own and partners pins to reach out to your target audience about new blog posts or product launches. Over 90 percent of all pinners say that they use the platform for researching their next buy. That is a very promising number for your business. Note that women are the main users of Pinterest, so if your demographic is female, you should definitely think about being active here. According to this article women far-out pin men on Pinterest (men only call for 7% of all pins on the platform). 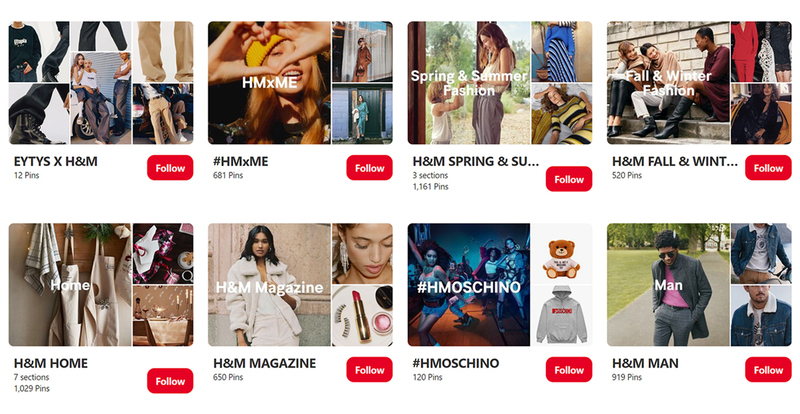 The key to reaching out to and gaining pinners for your Pinterest profile is to always have your target audience in consideration and create boards that will be useful to them. Things that spark an interest in people will result in a positive attitude towards your brand. Aesthetically your pins should be inspiring and match with your brand profile. Pin colorful pins to your boards if you are a more playful brand and vice versa. Want to know more? Check out this in depth guide on how to market your business on Pinterest. The most obvious choice for a profile picture is to use your logo without any text or slogan. This helps to portray a clean put together vibe especially when your profile picture is displayed very small next to posts and other visuals. It’s recommend to keep the same profile picture across all your social media platforms for maximum recognizability. Consistency is key for your brand! Here you can see Polo Ralph Lauren uses their logo icon as their Instagram profile picture. Tip: Test to see if your logo is centered and visible on different devices. You don’t want your logo to be cropped of in the corners. Your cover photo is a great way spice up your profile with a bit of creative freedom. Some great options for cover photos include using your logo again with your name and slogan, using an image that helps illustrate your brand’s story, or even a combination of an image with your logo over the top! Keep in mind that you’ll want a professional image for your cover photo as this is often times one of the first things potential new clients will see when they reach your page! Your cover photo should be clean, crisp and express the right emotion. Gucci displays an interesting scene from the ‘Garden of Eden’ as their Facebook cover photo which helps portray their brand in a certain way and tells their story. If you want beautiful high-resolution photos contributed by professional photographers, Unsplash is the way to go. With over half a million aesthetically pleasing photos to choose from you can’t go wrong. Did you know that with NewGlue you will get Unsplash on demand? And you don’t need to worry about dimensions, you can create the perfect sizes for all your platforms after purchasing a logo with us. We recommend using PNGs as your primary format when uploading your logos and visuals to social media. PNGs are a lossless file format which means you can resize and adjust them without much loss in quality! PNGs work great for images with lots of text and line-art, and also images that only contain a few colors like logos. In addition, PNGs can display millions of colors and support transparent backgrounds. One advantage to JPEG files is that they offer a larger variety of colors than PNGs. This makes them a great choice for professional photographs and super realistic images. However, in most cases we still recommend PNGs because JPEGs can lose quality and become pixelated much more easily when resizing or manipulating images. Another common image file format are GIFs but they are limited to only 256 colors. Since PNG files are superior GIFs in almost every aspect, you should stay away from using GIFs for logos and visual branding. Vector EPS is a high-resolution file intended for offline printing so if you are looking to use your logo on any physical items this is a great option. The Vector EPS format will work on a wide range of products from print on a small pen to something like a large billboard. If you still need help, check out our step-by-step guide on how to upload your logo to various Social Media platforms. In this example story we’re going to talk about Adam Smith, who has always had a dream of opening his own restaurant in Brooklyn, New York City. He envisioned his restaurant to have a rustic vibe where people can hang out, eat delicious food, and drink quality beer. 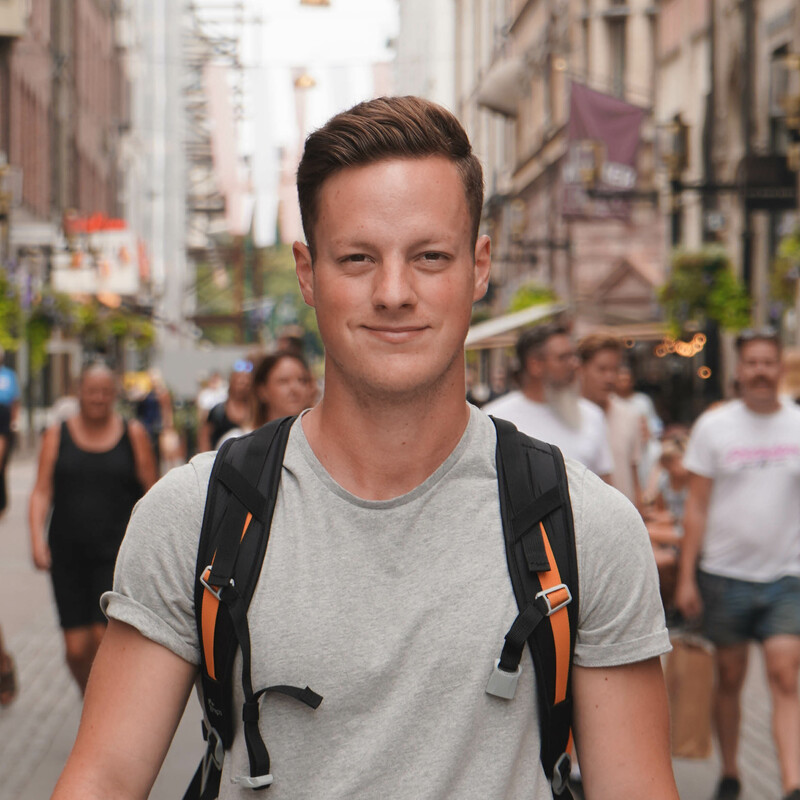 Adam’s mission is to connect people through food and therefore comes up with the name Wheat & Greet. The ’Wheat’ part represents his favorite kind of beer (wheat beer), and ’Greet’ emphasizes the socializing aspect that he hopes to offer. Here is the logo that Adam chose for his restaurant. Wheat straws surround the logo like a circle and in the middle, the cutlery come together and connect. At the top of the logo one can visibly see a crown which is a sign of for quality he is striving to bring his customers. The font is bold and direct, he doesn’t fuss around. And the small tagline for Brooklyn marks the area so that people know where his restaurant is located. 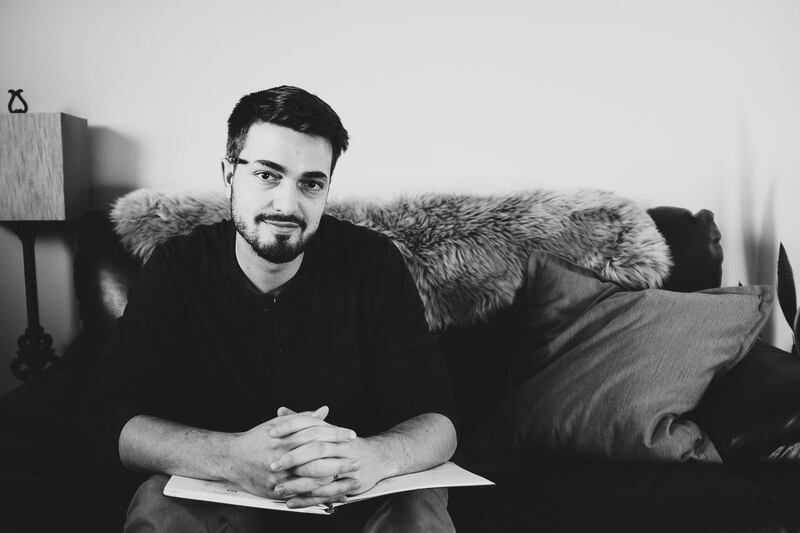 Adam understands the importance of a website and social media presence so he uses his newly purchased logo on various platforms. 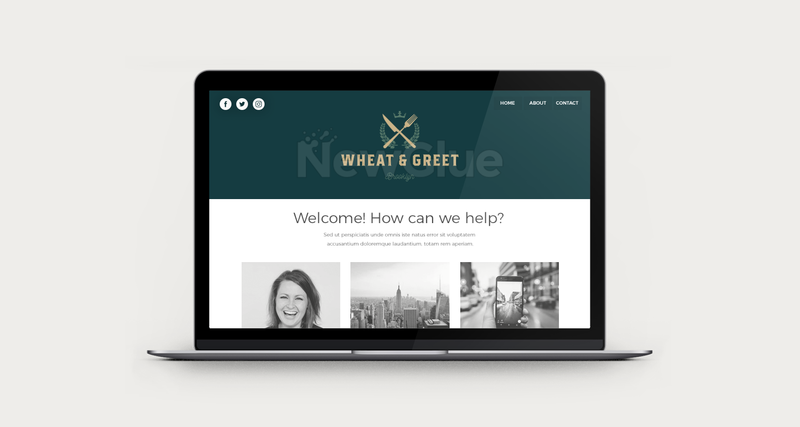 Regarding Adam’s website for Wheat & Greet, he puts the logotype at the top and use the brand colors to get the same vibe on the site as in the restaurant. To keep consistency, the colors that Adam chose for his logo also stay consistent through his entire brand. Remember what we said before? Consistency is key. Adam makes sure to have professional business cards with his restaurants name and logo visible. He also puts his logo on a sign that makes his restaurant more visible from the street. The sign can catch the eye of potential customers that are looking for a cool place to eat and drink. To create a sense of belonging in his team, Adam orders t-shirts for the staff to wear under their aprons while working. In order to create some professional looking banner photos Adam uses his logo in full white in front of professional pictures. He uses the service Unsplash to source his great banner photos. 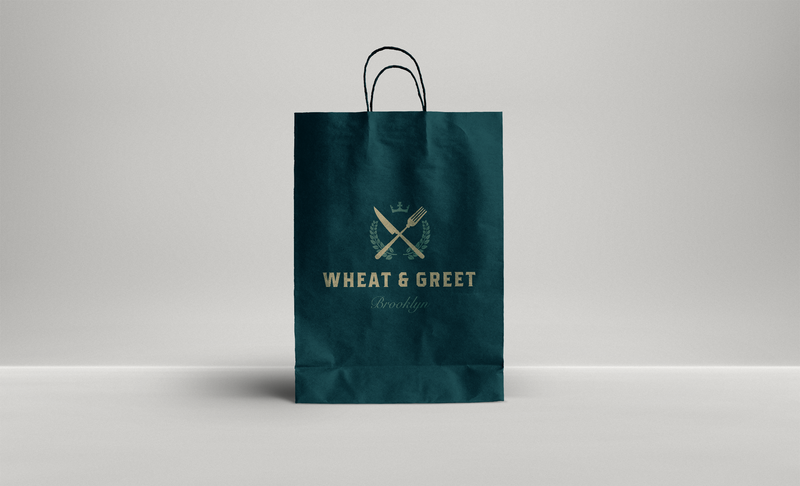 And for food delivery, Adam has also decided to have Wheat & Greet bags. In this way people who order take out will carry the bags around New York and Adam’s brand will get extra recognition. If you’re looking for an all-inclusive branding solution, New Glue gives you all the tools you’ll need to kickstart your business in the same way that Adam branded his new restaurant. When you purchase a professional logo with New Glue you will get different sizes of your logo to perfectly fit a number of online spaces, including Facebook, Twitter, Instagram, LinkedIn and more. You can also easily create custom sizes, no problem. New Glue also makes it easy to create social media covers, for example profile header images for Facebook, Twitter, and LinkedIn that can be customized with your logo. In addition, you will be able to alter your brand fast for seasonal or motivational purposes by using our high-quality image bank sourced from Unsplash. You can embed your logo into inspirational images to create fantastic branding effortlessly. It’s also easy stay on top of the current trends by adding cute variations (for example your logo on a pumpkin for Halloween) instantly to download and share. Of course we offer 24/7 brand storage, so you can always come back and download your assets whenever, wherever! Check out how your business could look with our stunning, professionally designed logos. Each logo was hand crafted by a professional graphic designer and you can browse between thousands of different styles to find the logo that is just right for your business! 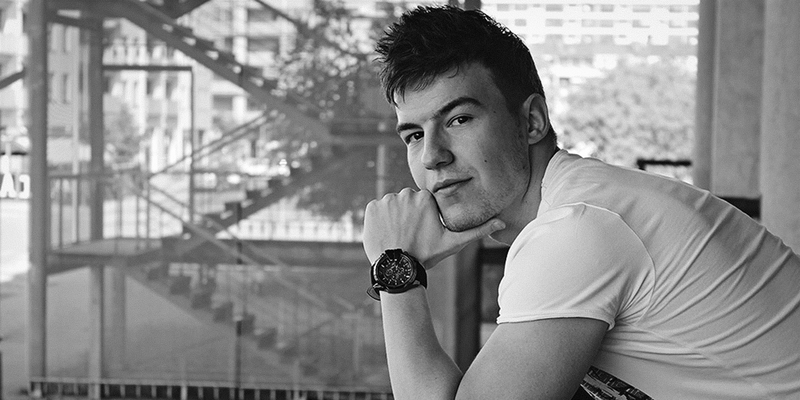 Meet Artsigma – Legendary Logo Designer!